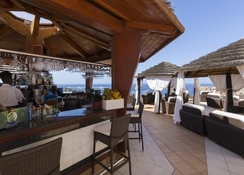 Endowed with a beautiful clifftop location, Gloria Palace Amadores Thalasso & Hotel offers marvellous ocean views and is within walking distance to Gran Canaria’s two popular beaches – the lively beach of Puerto Rico and the white sandy Amadores beach. The beach vibe is extended to the rooms and suites that look out to the Atlantic Ocean. 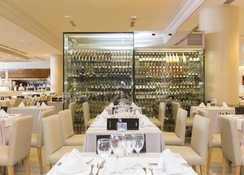 Guests can indulge in gastronomic delights at the hotel’s buffet restaurant, while enjoying panoramic views of the sea. 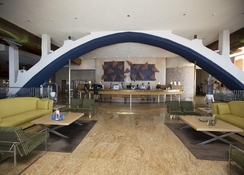 The hotel also boasts four bars that serve drinks and snacks. A perfect destination to enjoy your beach holidays in Puerto Rico, this luxury spa hotel is home to one of Europe’s premier thalassotherapy centres, featuring fitness pool, hydrotherapy, aqua gym, sauna, Turkish bath and a variety of massages. Recreational amenities include two outdoor pools on the terraces, kids’ pool, children’s park, clubs for kids and teenagers, fitness centre and amenities for sports like tennis, archery and golf. Gloria Palace Amadores Thalasso & Hotel is located next to the sea in the pretty resort of Amadores in southern Gran Canaria’s Costa de Mogán. There’s also a lift connecting the hotel directly with the pedestrian seafront promenade, which goes from Puerto Rico to Amadores beach. There is a wide choice of shops, restaurants, bars and other leisure activities near the hotel. There’s a taxi rank by the hotel and the bus stop is 300 yards away, while the Gran Canaria Airport is a 30-minute drive (50 km). Featuring 364 rooms and suites categorised into five types, Gloria Palace Amadores Thalasso & Hotel suits every kind of traveller. 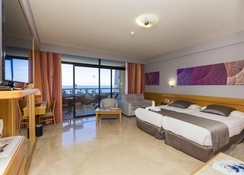 The spacious and elegant rooms, which can accommodate up to 3-4 persons, come with a separated living room and a furnished terrace or balcony that affords panoramic views of the Atlantic. All the guestrooms feature air conditioning, sofa bed, TV, telephone, radio, free Wi-Fi and fully-equipped bathroom with shower. One might have to pay an extra charge for using minibar and safe. The exclusive Thalasso rooms and suites offer a few added amenities such as complimentary ‘get in shape’ pool treatment at the in-house Thalasso Centre each day for each person, sauna, gym, as well as bathrobe, slippers and pool towels. The main restaurant of Gloria Palace Amadores Thalasso & Hotel serves breakfast, lunch and dinner in buffet style. The restaurant has an outdoor terrace where guests can enjoy fantastic views of the sea while dining alfresco. With a variety of international dishes, show cooking and theme dinners, the restaurant is a great place to enjoy a relaxing meal. There are four amazing bars on offer at the hotel. Lobby Piano Bar hosts live piano music during the day, while the Lounge Bar, featuring a sea-facing terrace, organises live music, shows and dances every night. Next to the seafront promenade is Paseo Bar, which serves cakes, ice creams, cold sandwiches and snacks. There’s also a Snack Bar on the terrace where you can get drinks and snacks, as well as a selection of haute cuisine dishes. 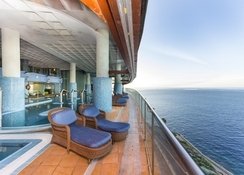 Gloria Palace Amadores Thalasso & Hotel, Gran Canaria features two freshwater pools (heated water in winter) on the terrace with sun beds and parasols. One of the pools is accessible to disabled travellers and there’s an independent area reserved for naturists. Among sports activities, guests can enjoy table tennis, bowling, archery, tennis, billiards and carbine shooting. The hotel also gives discounts to its guests to tee off at the nearby golf courses. The in-house Thalasso Gloria – Amadores is one of the most complete thalassotherapy centres in Europe. It offers thalassotherapy programmes (mud bath, algae therapy or aromatherapy), a variety of pools, 29 hydromassage stations, aqua gym, hydrotherapy, massages, sauna, gym, Turkish bath, Scottish shower, Kneipp shower and personalised treatment cabins. For younger guests, the hotel has children’s and teenagers’ clubs, park, kids’ pool, mini disco and daytime entertainment and games. NOTE : The Thalasso Centers at Gloria Palace Amadores Thalasso & Hotel will remain closed for maintenance works during S19: From 13.05.2019 until 19.05.2019.